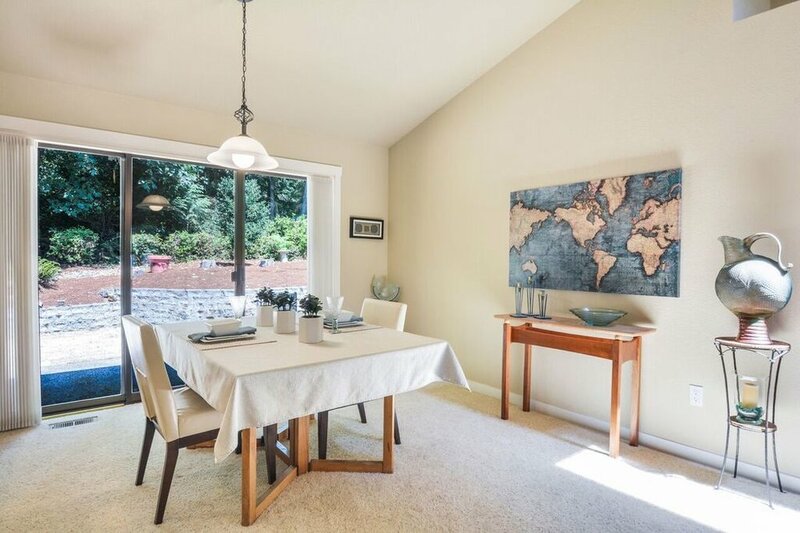 The dining room is spacious and bright beneath the vaulted ceiling. The triple panel sliding glass door leads to the patio and back yard. A covered, paved front entrance is convenient in all weather, providing shade, and shelter from rain. This single level condo nestled in the evergreens of Harbor Crest on Peacock Hill provides comfort and privacy while placing you just 4 minutes from the parks, bakeries, and breweries of downtown Gig Harbor. On a cul de sac at the end of this quiet, gated neighborhood find a tranquil home with vaulted ceilings, an open floor plan, bright skylights, a peaceful yard, and ample parking. A single a/c unit keeps the whole house cool even in the heat of July and August! Dues cover lawn service & exterior maintenance (and more - see below) to keep life low stress. 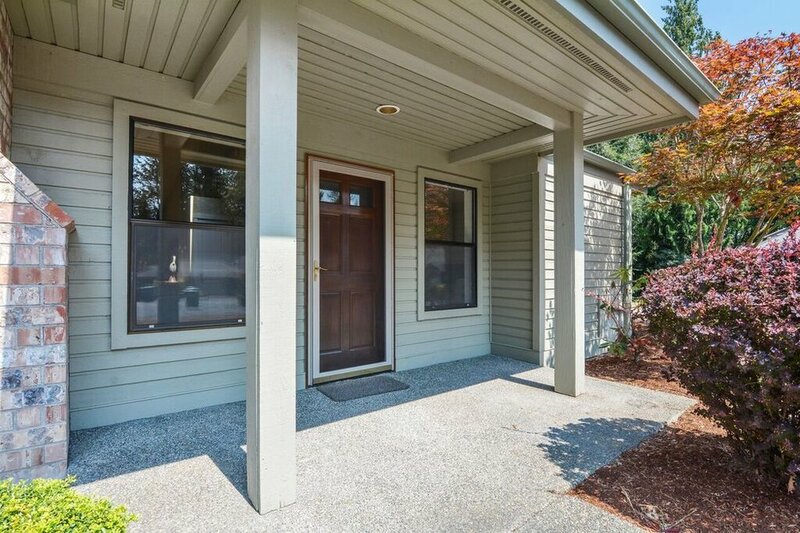 5 minutes by car to the YMCA, Costco, and all the shops in Gig Harbor North, and 6 minutes to St. Anthony Hospital. This neighborhood is about peace. It's a place where the front yards are bright and open and lots of light comes in, while the back yards are bordered by tall evergreens, mossy maples and alders, and iconic Pacific Northwest madronas. Hear an owl hooting at night and catch glimpses of deer stepping through this park-like setting. The neighborhood gate is closed from 7 pm until 7 am, which keeps the street especially quiet in the evening hours and at night. At the end of this private, tree-lined neighborhood, turn into the paved driveway from the cul de sac and park in the 2 car garage. Or, step out of your car in the fresh air and head up to the front. A wooden front door opens onto the stone entry of the living room with a cozy propane fireplace. The vaulted ceiling provides a spacious feeling to this open floor plan, and the skylight keeps the room bright with natural light. Notice the coat closet under the skylight. The front door opens onto a stone entry so shoes can come off before stepping into the living space. 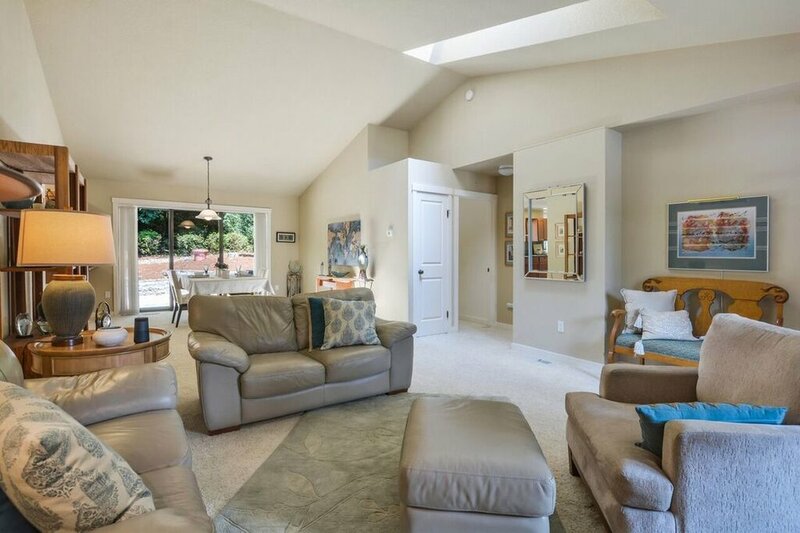 This is the heart of the home, where vaulted ceilings and a skylight rise over a comfortable fireside living room that flows into the dining area. The living room is cozy with its propane fireplace, white mantle, and stone hearth. A coat closet is a nice touch in this room, especially convenient for guests. While we're still near the front of the home, we should note that the screen in the screen door can be switched for a glass piece (found in the garage) for winter weather. Another view of the high vaulted ceiling over the open floor plan of the living and dining area. The stone hearth extends to the front door. The dining room beneath the vaulted ceiling is bright and open to the kitchen. The triple panel sliding glass door leads to the patio and back yard. The triple panel sliding glass doors let some of the outside in with a view to the lawn and evergreens beyond. The dining room shares that same tall vaulted ceiling and is bright with a sweet view to the back yard through a wide triple-panel sliding glass door. And all of this is seamlessly connected to the kitchen. Pull a stool up to the bar counter to chat with the cook, have a casual meal in the eat-in kitchen, or set the dining table for dinner. Living room, dining room, and kitchen flow together, but each has its own space under these high ceilings. Notice the door to the garage near the entrance to the kitchen. The kitchen is finished with granite tile counters, stainless appliances, a double sink, plenty of window light, a skylight, and a nice bar counter where you could pull up a set of stools. Easy to clean vinyl floor, big windows over the sink, and generous cabinets for storage. The kitchen is equipped with stainless appliances, double sink, granite counters and backsplash, a nice array of cabinets in a warm wood tone, a glass top stove, access to the garage, and you'll even find the stacked washer and dryer in a closet that doubles as a convenient pantry space. A neutral vinyl floor makes this a practical, easy to clean room that you can decorate with any color scheme you like. Set a table in the eat-in kitchen's breakfast nook for a cozy kitchen meal lit by the skylight above. 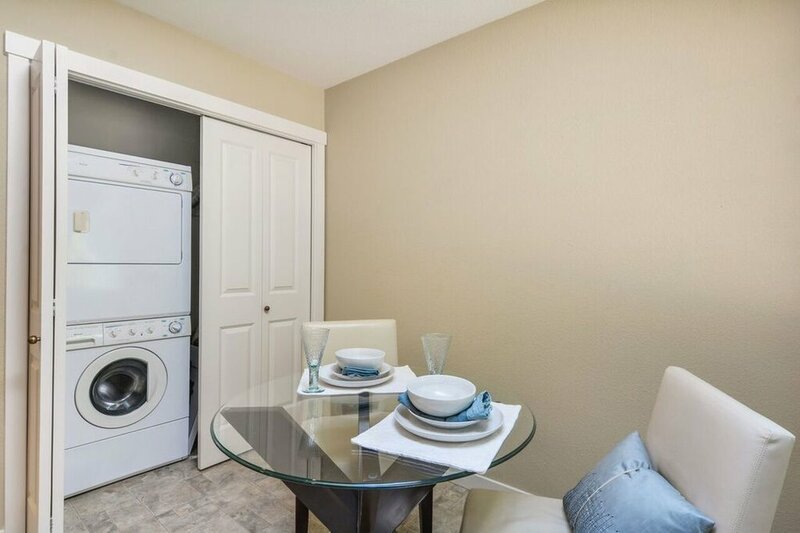 Stacked washer and dryer conveniently located off the kitchen with pantry shelves behind the other door. Glass top stove, dishwasher, microwave, refrigerator, plenty of counter space, and garage access (not pictured). Another view of the many cabinets and drawers provided in this well appointed kitchen to help keep you organized. 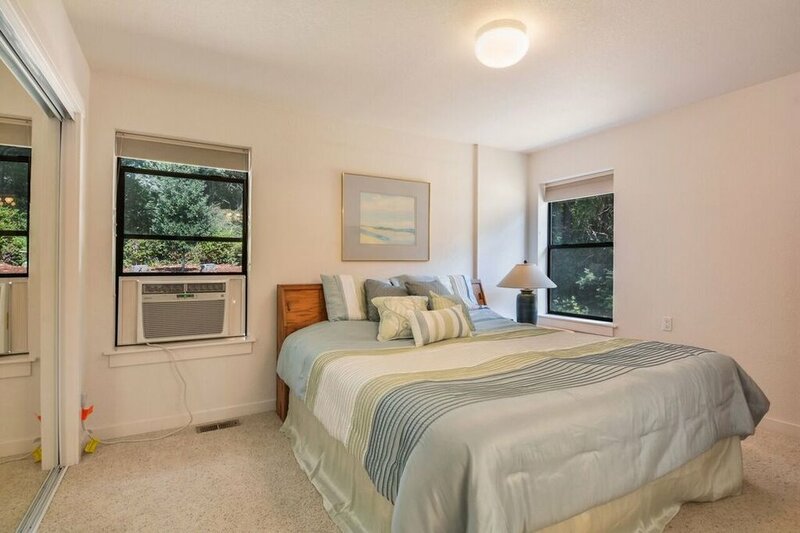 This back bedroom suite features a private 3/4 bath, windows overlooking the back and side yard, and generous closet space. Another view of the suite with just part of the mirror doors of the large closet in view. The air conditioning unit keeps the whole house cool even in July and August heat! In a hall off the living and dining room find the 2 bedrooms and bathrooms. The back bedroom is a suite complete with a private 3/4 bath. The bedroom features a big closet with full mirror doors running the length of one wall for plenty of space for hanging clothes or tucking other items away. Windows overlook the back and side yard, with an air conditioning unit placed in the back window that ensures there's not a hot spot in the house even in this summer's heat. The suite's private bathroom is brightened by a skylight, and you'll find a spacious shower with a glass surround. The vanity includes both cupboards and drawers for storage. Private 3/4 bathroom attached to the main bedroom with beautiful skylight above, spacious shower, and plenty of storage in the vanity's cupboard and drawers. Step back out into the hall for the full bath with yet another skylight, a shower/tub combination with a glass tub surround, and a huge mirror over the vanity to keep things bright. Again you'll find easy-to-clean vinyl floors and neutral colors that welcome towels and mats of any shade. The front bedroom is well lit by windows on 2 sides of the room, has a nice closet with white sliding doors, and could function well as an office or den, sewing room, second bedroom, guest room or even a combination of these depending on your needs. A second bedroom at the front of the house includes a spacious closet, good window light, and would also make a nice office, den, sewing room, or combination. This full bath is accessible from the living room and is next door to the second bedroom. A skylight brings in natural light and the large mirror helps keep things bright. The 2 car garage entered from the level, paved driveway, or through the door off the kitchen includes attic access and additional storage possibilities to the home. 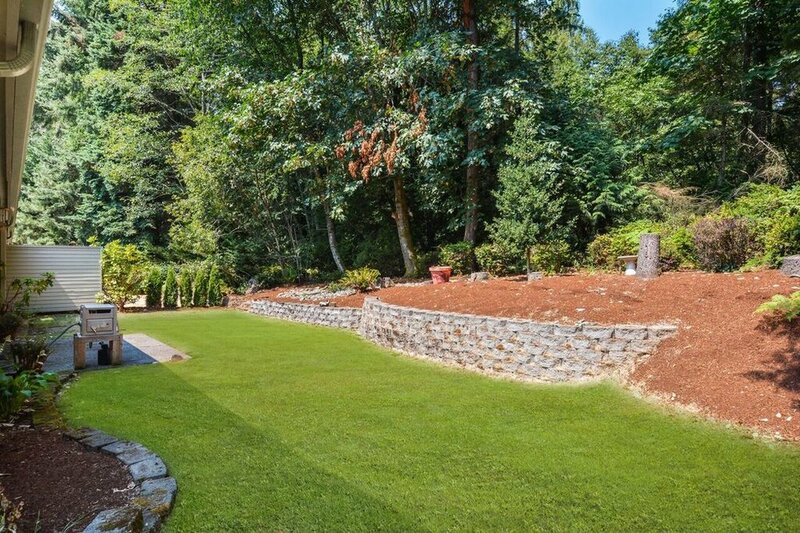 The back yard is bordered by maples, Douglas fir, cedar, alder, madrona, huckleberry bushes, and has a nice shape with the wall creating multiple levels. 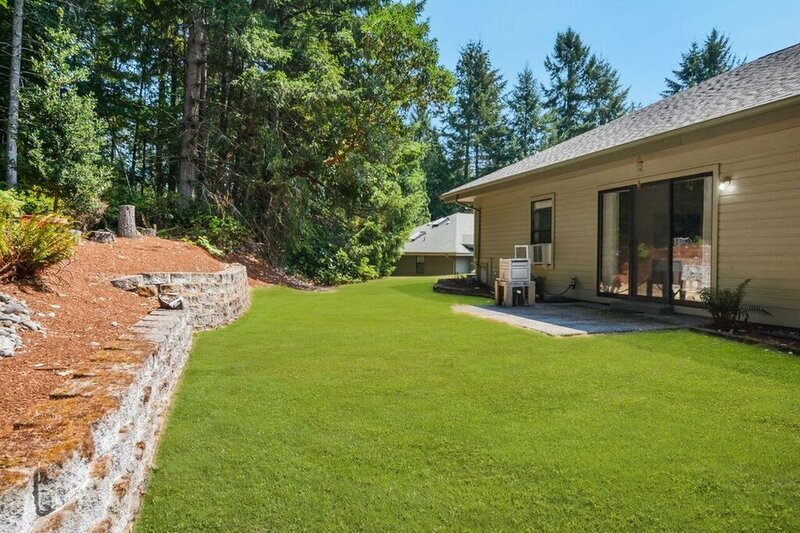 Outside, this home offers a private back yard with a lawn and plantings to compliment the natural wooded surroundings. You'll see maple, madrona, Western Red Cedar, Douglas fir, and evergreen huckleberry, just to name a few. Landscaping blocks form a low wall that helps separate the lawn and patio area from the trees and creates another level for featuring shrubs, pots, and other plants. Japanese maples and a lawn bring life to the front of the home. A sprinkler system is in place and the HOA dues (see more below) cover lawn mowing. The front lawn wraps around to this side yard and connects to the private back area. This side of the lot is open to let sunshine in. Another view of the lawn from the back corner of the lot looking toward the back bedroom windows, and the sliding doors into the dining room. A small patio outside the dining room provides a nice little spot to sit or even set up a bistro table. Harbor Crest is a gated condo neighborhood on Peacock Hill above downtown Gig Harbor. 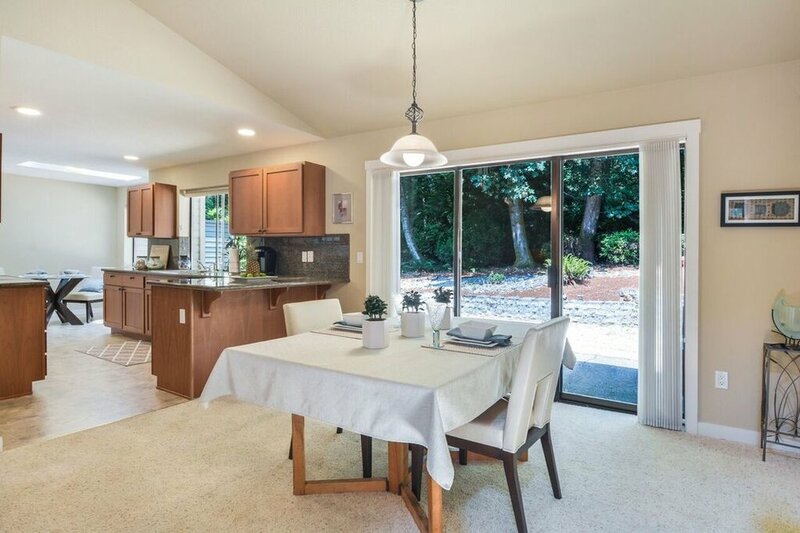 It's a quiet, peaceful community surrounded by evergreen trees with easy access to Gig Harbor's downtown waterfront, the Gig Harbor North shopping area (where you'll find things like Costco Wholesale, Target, PetCo, Albertsons, Starbucks, etc), the Cushman Trail, and parks. Take a look at our list below with drive times to many favorite destinations in the area. Don't miss majestic Mt. Rainier in the background beyond the mouth of the harbor! 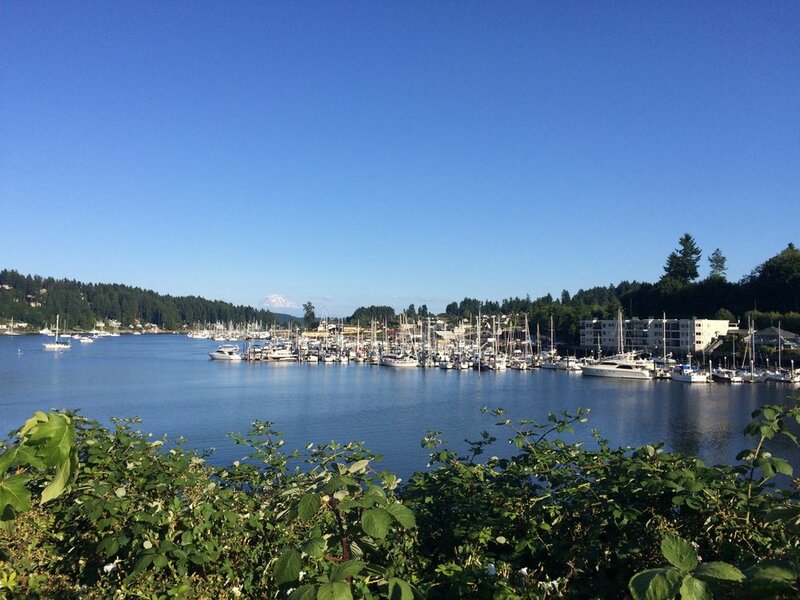 You can read even more about Gig Harbor on the neighborhoods page of our site (featuring Tacoma neighborhoods and surrounding areas like Gig Harbor and the Key Peninsula). For more information about this open, single level condo, call or text me at 253-226-2787. 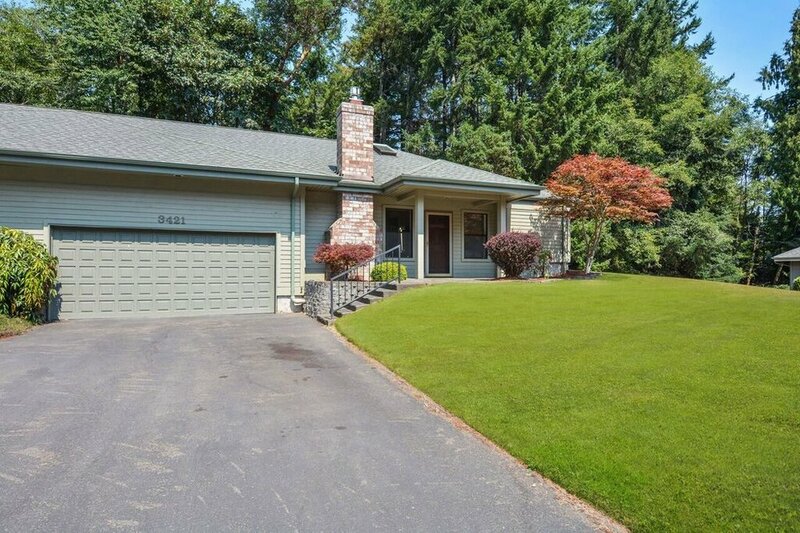 I'll be happy to answer your questions about this home or the Gig Harbor/Tacoma real estate market in general. Or drop by for the Open House this Saturday, August 11th from 12-2 pm!